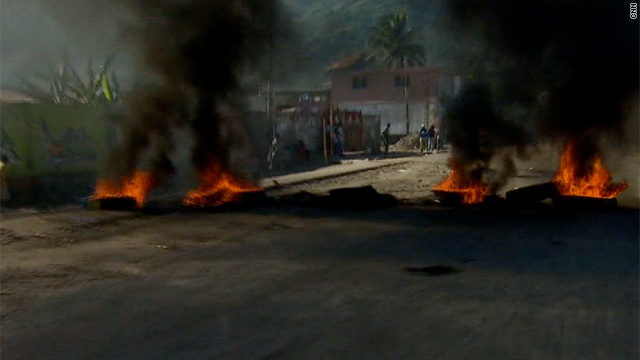 Angry over the cholera epidemic, demonstrators have put up networks of barricades through the streets of Cap-Haitien, Haiti. Cap-Haitien, Haiti (CNN) -- The Christian Motorcyclists Association came to Haiti to distribute motorcycles to pastors. Instead, angry Haitians, some of them on motorbikes, ended up attacking the 11 American missionaries when they tried to flee this city aboard a big, yellow bus. "We almost made it out of town," team member Kerry Gibson told CNN in a phone call after his team survived the attack unharmed. Until Wednesday morning, Gibson and his fellow volunteers had been holed up in a hotel on a hilltop overlooking Cap-Haitien, after demonstrators put up networks of barricades through the streets and began attacking the bases of United Nations peacekeepers with rocks, bottles and petrol bombs. The demonstrators have accused peacekeepers of starting the cholera outbreak. The motorcyclist team is part of an American organization that has hundreds of branches across the country. One of its goals, Gibson said, is to donate motorcycles to Christian leaders. "We put wheels under indigenous local pastors," Gibson explained. "We were presenting seven here in Cap-Haitien. Obviously, that won't happen now." Given the violence that has led to the death of at least one protester, the team decided Wednesday to cut their trip to Haiti short by a week. A Haitian pastor informed Gibson that the road out of town was open, so the missionaries climbed aboard a commercial bus and tried to make it into nearby Dominican Republic. But on the outskirts of Cap-Haitien, the bus suddenly ran into trouble. "We saw one guy with a machete raised up and he's running and yelling and screaming and pointing up ahead. We suspect they put a blockade up in front of us. That's when we stopped and they busted out the glass on the door," Gibson recalled. "Our driver, he was like a NASCAR driver. He started backing up," Gibson said. "But they put out two burned-out cars on the road in an effort to block us." Gibson said protesters began hurling rocks at the bus and smashed the windshield. The bus was incapacitated and started spraying oil. At some point, demonstrators dragged a Haitian employee of the bus company out of the vehicle and began beating him. Gibson said the driver then maneuvered the bus onto the sidewalk and lurched the vehicle forward toward the gate of a nearby U.N. peacekeeping base. "I feel like God protected us," Gibson said. "Just the fact that the bus stopped, died right in front of the U.N. compound, is confirmation that he's looking out for us." Peacekeepers from Chile opened the gate and ushered the bus and its passengers inside the compound. The 11 CMA representatives were preparing to spend the night with the Chilean military and pondering their next step for escaping Cap-Haitien. Gibson insisted that, throughout the adrenaline-packed attack on the bus, he never felt he was in danger. The man who was dragged off the bus escaped without serious injury, Gibson said. "Of course it's a nerve-wracking situation, but I never got the impression that there was any real effort to do physical harm to us." Asked what he planned to do Thursday, he said, "Pray a lot." Journalist Dmitri Fourcand contributed to this report.